Making business operations easy and carefree, the Scheduled Email Reports for WooCommerce Add-On helps WooCommerce store managers automate the reporting process by letting users automatically send reports as an email attachment on a recurring schedule. Scheduled Email Reports for WooCommerce is not a standalone plugin, but an add-on extension that works in conjunction with specific compatible WooCommerce reporting plugins: Product Sales Report, Product Sales Report Pro, Export Order Items and Export Order Items Pro. Using the Scheduled Email Reports for WooCommerce add-on in conjunction with one of the compatible plugins lets users bypass the process of manually generating a new report every time; instead, they’ll automatically receive a report via email as an attachment on a regular schedule. After installation and activation, the Scheduled Email Reports for WooCommerce add-on will appear as a menu item in the WooCommerce menu in the WordPress dashboard. The add-on integrates seamlessly into the WordPress aesthetic. Setting up scheduled emails is done by using the familiar WordPress post editing interface. 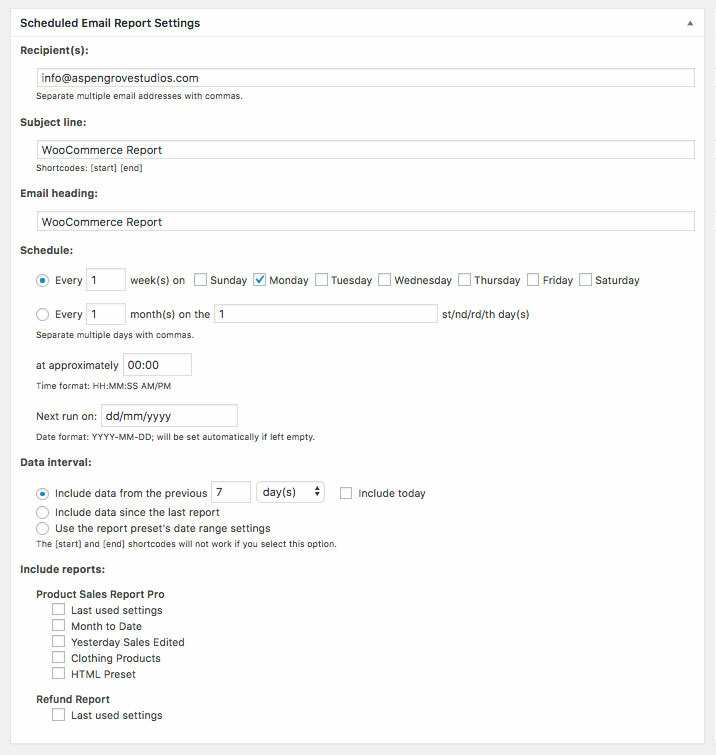 On the main page of the Scheduled Email Reports for WooCommerce add-on plugin, users will be able to see their scheduled email reports once they’ve been set up and saved. Adding a new scheduled email report is incredibly simple as the add-on plugin’s interface makes use of the familiar WordPress editing screen. 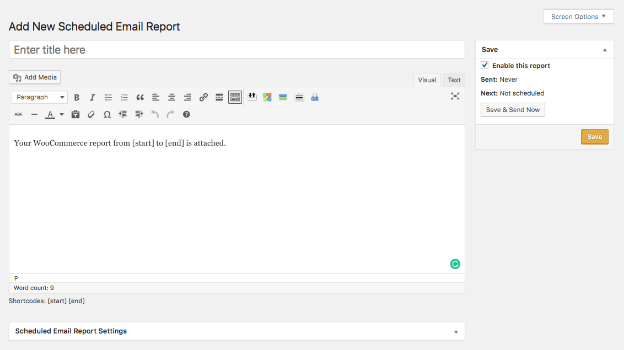 Users can enter a name for the report in the Title section and can also add original text for the email body by changing the text in the editor. Users are able to set the details of the scheduled email report in the Settings box. Here, users can specify the report recipient or recipients, customize the subject line and set the email schedule. Emails can be scheduled to be sent daily, weekly (including several times per week), or monthly, at approximate times. Also in the settings, the user can specify the date interval of the report, and also set which of the reporting plugins (Product Sales Report, Product Sales Report Pro, Export Order Items and Export Order Items Pro) they’d like to include a report from in the email, including which preset(s) should be used (for plugins that support reporting presets).